Next on the list: an open water swim. Big Shark Bicycle Company (Disclaimer: Big Shark is a sponsor of the St. Louis Triathlon Club, of which I am a member). Race time was 7:30AM. Last racers entered the water about 8:10. Parking is available on the lots that are off to the sides of Civic Drive, which is where the Expo and the finish line are. 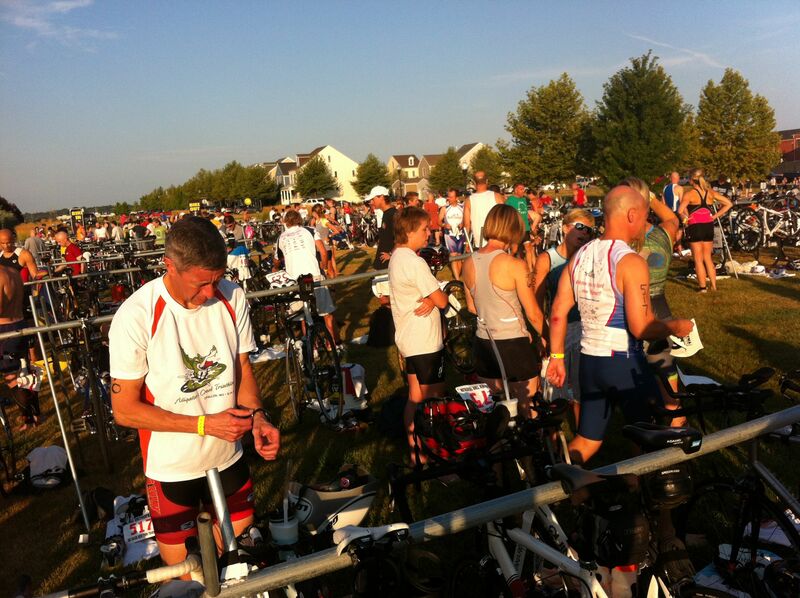 The transition area itself is down by the edge of the lake, so there is a little bit of distance to cover there. You might consider riding it, although everyone I saw walked their bikes. If you do decide to ride it, you will remember to put on your helmet so as to not risk disqualification, right? The New Town Triathlon has been going on for a few years now and has become quite large, there being roughly 600 participants in 2012. 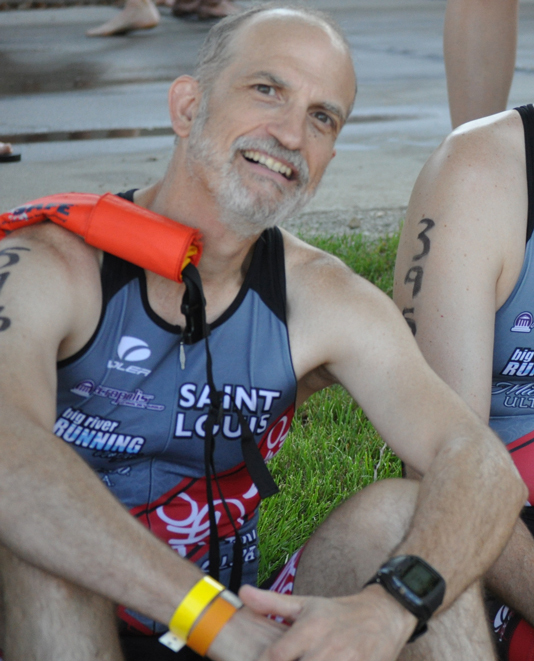 New Town is a planned community located in the plains of St. Charles County, between the Missouri and Mississippi Rivers, and the terrain is best characterized as absolutely flat and fast, and is one of the relatively few triathlons in the immediate St. Louis area with an open water swim. There is in fact an open water practice swim series in May and June on Saturday mornings. The race is accompanied by a two day vendor expo. There is a kid’s triathlon on the day before the race which in 2012 had about 90 participants. The race is chip timed (ankle bracelet) including transitions. Lifeguards were provided by BYLG (Backyard Lifeguard). The swim course makes its way along the shoreline of the manmade lake in New Town. The lake is relatively shallow and, being mid-July in St. Louis, the odds of it being wetsuit legal in any given year are practically nil. There is an elite start followed a few minutes later by the age group start. The start is actually a time trial start with each racer going across the timing mat and into the water in 3 second intervals. Bib numbers are assigned according to age (late entrants go at the end), and the lineup is by bib number, which is how I wound up being #573 and with a very real possibility of being the last one out of the water! The age groupers start at 7:30 and were all in the water by about 8:10. Due to the shape of the lake, many of us in the older age groups got to see the elite racers finish the swim and enter transition. Once you cross the mat, you go down rock steps into shallow water and turn left (east) to begin swimming. The start was very comfortable for a newbie as you are around other swimmers but far from the “washing machine” mass or wave start. Something to note is that you probably want to get an idea of where the first buoy is as you are waiting to get into the water. Since you are swimming east, i.e. into the Sun, it is quite difficult to actually see the buoy once you are swimming. My advice is to follow the bobbing heads in front of you, plus if you stay at a fairly constant distance from the shore (on your left), you’re going the right way. After the first buoy, you have a short leg, followed by the long leg that heads back to the west. Up to this point you can help yourself out by checking your distance against the shore off to your left, and this is true on this leg until you pass the last house on the shore. Beyond this point, you need to be aware that the shore veers off to the left, and so will you if you are not careful, I managed to do this during the practice swims every single time. But after the first buoy, it is easy to see the rest of them. After the last turn, you are swimming straight towards the exit, at the corner of the lake. 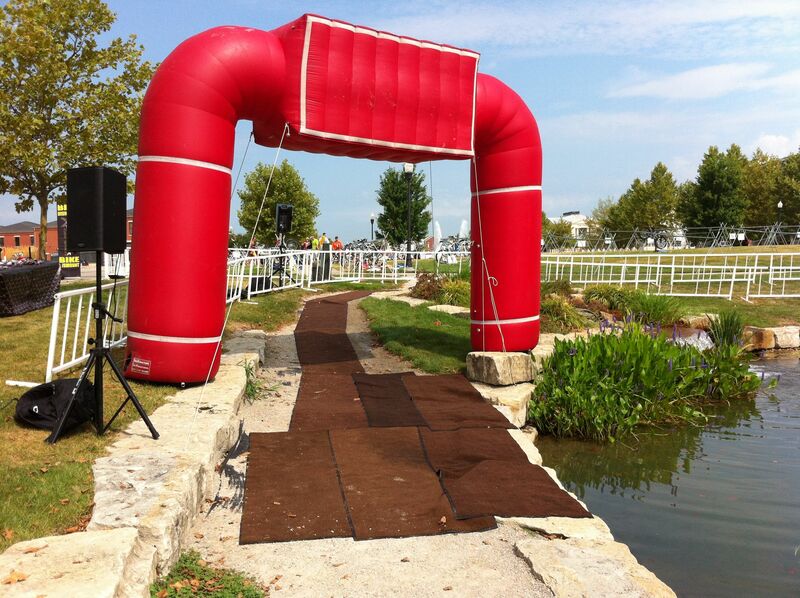 During the practice swims, the twin spires in the middle of New Town make for good sighting, but during the race there is an inflatable finish arch on the land adjacent to the swim finish, which is even better. The exit is up a two level rock ledge, with wonderful volunteers to help pull you out. If you are a newbie at the open water swim, be advised that you have been in a horizontal position for some time, without having done any turns or direction reversals as you would in a pool. You may find yourself disoriented as you get out of the water. It varies by individual, but I find myself in the “woozy” camp. Exit area for the swim, with transition area in the background. The path to the transition area entrance heads off to the right. 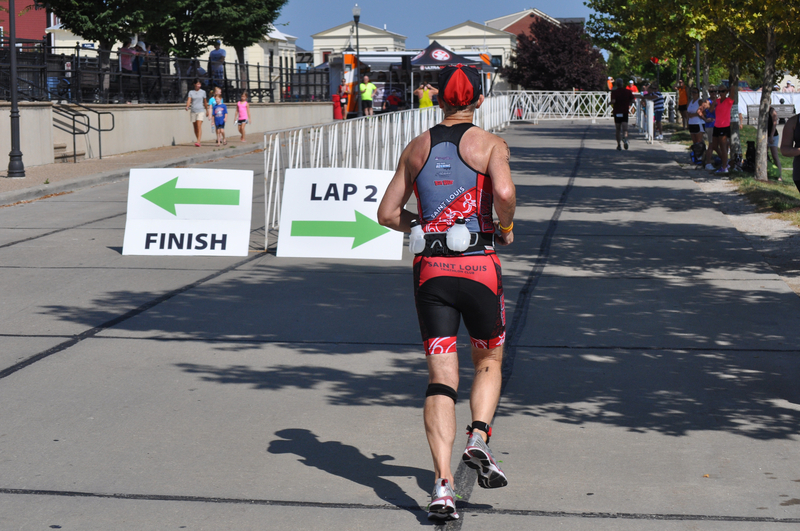 The transition consists of getting out of the water, passing through the swim finish arch, and then going off to the right, around the transition area, and entering in the same location as the run out exit. The bike out exit is on the opposite side. The racks were arranged in bib order, so if you are an older person, you get to your bike soon and have a ways to go to get to the bike out exit, and the opposite is true if you are younger. The more “senior” end of the transition area. The area around New Town is one of the region’s favorite “flat training rides”. It is very similar to the courses for the St. Peters Race to Recycling Duathlon and the St. Peters Rec-Plex Triathlons, with the exception of being devoid of any hills whatsoever (the other two races involve some hills in getting to and from the flats). The course was well staffed by volunteers and law enforcement. There is normally very little traffic on this course and I don’t remember seeing any at all during this ride. It is a pleasant, bucolic ride. One thing I have noticed about this area is that it seems the wind always blows in the opposite direction one would expect. The wind tends to come from the south, so generally you will be getting more headwind on your return than when you are heading out. If you have done practice rides in the area, you are probably aware of the grates in the road going in and out of New Town itself. These are covered during the race, but you will still need to be ring reasonably slow anyway due to the loose gravel that is adjacent to these. Volunteers were in place to point these out. The bike-in is on the west side and the bike-out is on the east side. The run is four miles, two loops of a two mile route that covers goes all around New Town. As noted, it is extremely flat throughout. The water stations are close to the transition area, and near the entrance to New Town (the roundabout with the obelisk). And the best thing about the race is the contribution of the New Town residents! They come out in full force with their water hoses, ready to hose down any one who so desires. And believe me, I ran through every single one of those streams of water! There is some shade on parts of the course but in general it is in the open. This was my first open water race. 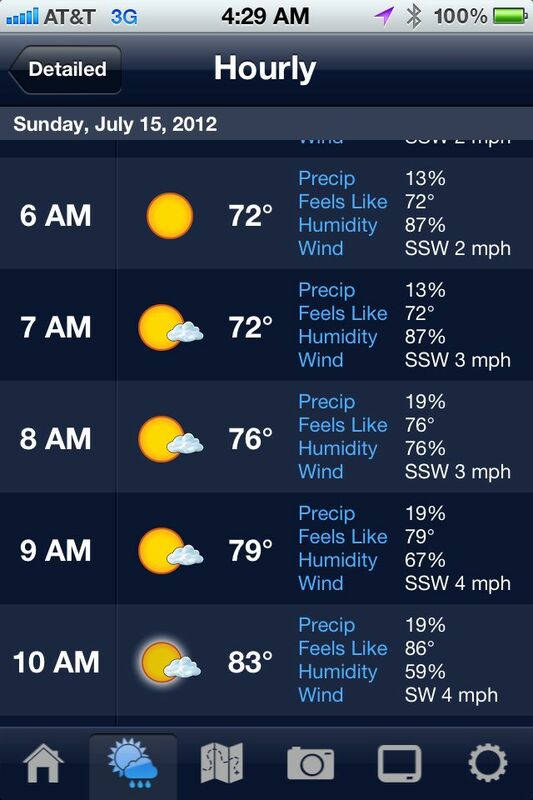 I was familiar with the course due to the open water swim sessions already mentioned, so there were no real surprises. Later in the day, it occurred to me that I actually enjoyed the swim leg of the race. This surprised me since swimming is my weakest discipline; I am slow, but am comfortable in the water since I grew up on a lake. It occurred to me that I think I enjoyed the open water swim more than the pool because, well, the pool still seems more alien to me. So the lesson is not to assume you’re going to have issues with a particular aspect; do the training for it (and I certainly recommend the open water swimming sessions), then do it and decide for yourself! This entry was posted in Race Reviews by Bill Sanders. Bookmark the permalink.